As Los Angeles County residents continue their love affair with growing backyard gardens and garden-to-table living, UC Cooperative Extension in Los Angeles County is pleased to announce the Grow LA Victory Garden classes for spring 2016. Taught by UC-certified Master Gardeners, this popular low-cost series, now in its sixth year, will be held at 15 community sites around the county. Locations include community gardens, schools and nonprofit agencies. Grow LA helps new gardeners start their own gardens quickly and easily in a container, in the backyard or at a community garden, bringing together local families and neighbors to share their experiences, skills and produce. Participants will be able to turn their new gardening interest into successful gardens "from the ground up," lower their grocery bills and enhance their opportunities to eat healthy, nutritious foods. UC Cooperative Extension's Master Gardener volunteers will take the beginner gardener through the basics of soil preparation, planting, pest control, irrigation and harvesting. Participants will meet three or four times and engage in hands-on activities. Upon successful completion of the series, participants will become UC-certified Victory Gardeners. To view the spring schedule or to register for a class, please visit the Grow LA Victory Garden online page. 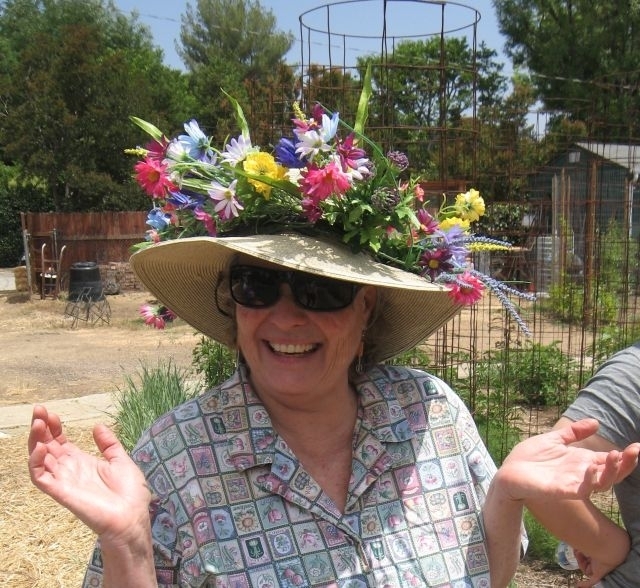 Yvonne Savio, Master Gardener coordinator for UC Cooperative Extension in Los Angeles County, retires after 21 years of working to grow an impressively large crop of gardener volunteers. She worked with hundreds of gardens in schools, communities, senior centers and homeless shelters to get gardening information to those who needed or wanted it. She and her army of volunteers taught thousands of residents how to grow their own food. Before her official retirement date at the end of June, I chatted briefly with Yvonne to ask her several questions. Who or what got you into gardening? My folks purchased our Pasadena property because of a heritage oak. They created pathways throughout the hillside, planted fruit trees and drove annually to the dairy, where Pasadena High School now stands, to load up on fresh manure and lay it down as mulch. My mom grew lots of vegetables, and my dad took care of the fruit trees. I grew up eating seasonally, and whatever was in the garden determined what we had for dinner. Also, my years living in Davis (to work at the university) affected my gardening tasks and skills. For the first time, I experienced real cold and heat, and what they meant in the garden. You are widely recognized as the person responsible for much of the success of the UC Master Gardener Program in Los Angeles County. How does that feel? 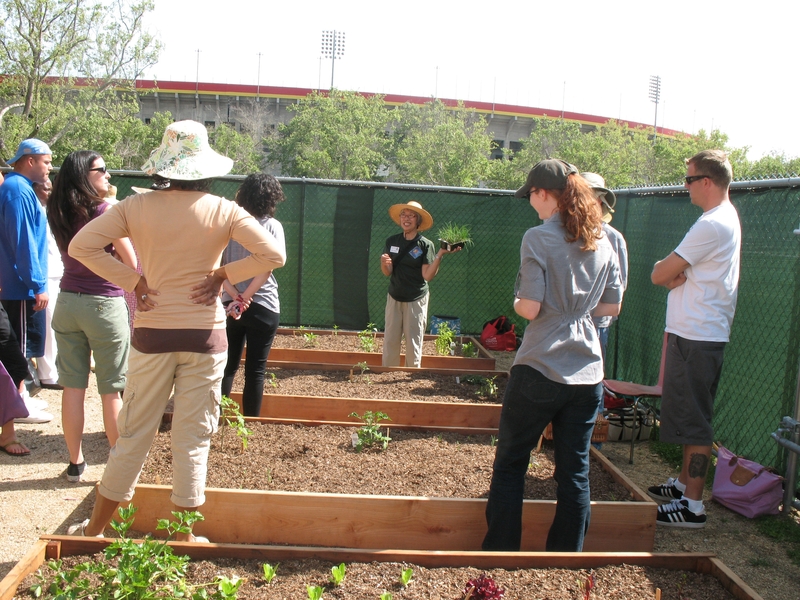 Our wonderfully generous Master Gardener volunteers are the reason that 1.3 million people in Los Angeles know how to grow their own food. I have just been providing the avenue so they can follow through with their nurturing passions. Since 1994, we've trained 1,127 volunteers! From a single tomato plant to providing all the produce for their families, Los Angeles County residents learned how to feed their families, connect with their neighbors and garden sustainably! What's changed in gardening during your 21 years with UC Cooperative Extension in Los Angeles County? When we re-started the Master Gardener Program in 1995, only gardeners were interested in growing their own food; now, the general public is eager to join in connecting health and exercise to community beautification, sharing and intergenerational appreciation and cooperation. Is there a fruit or vegetable that you find satisfying to grow? Everything, of course! There's always something new and exciting to explore. Can you describe a memorable day with the Master Gardener Program? Every single day! I thrive on hearing the excitement of Master Gardeners enthusing about their latest project in their community and school gardens as well as enabling other gardeners to grow and taste their own first pea or broccoli. Now, what's next for you? What's your goal in your next phase? 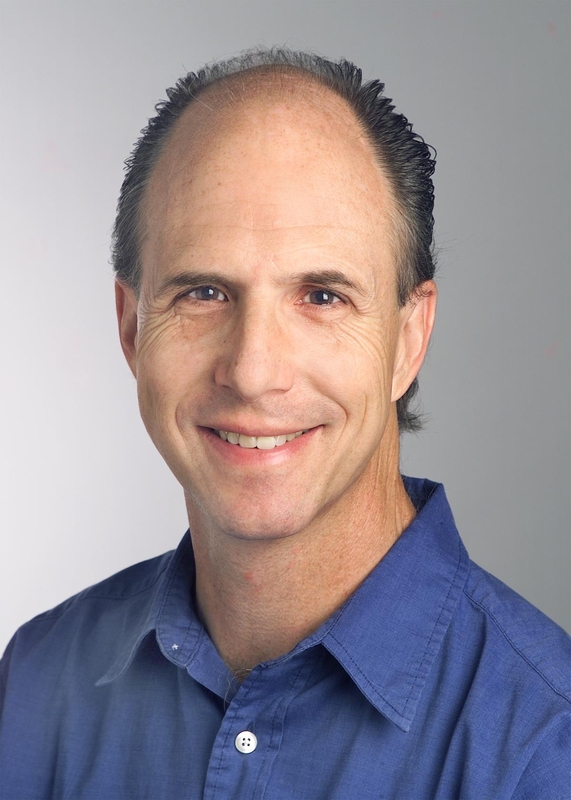 My personal website/blog: www.GardeningInLA.net. The site is a resource center of information about our local micro-climates, and it will offer an opportunity for Southern California gardeners to submit events, volunteer opportunities and job opportunities for everyone to benefit. Members of the inaugural class of the Mountains Recreation and Conservation Authority's Bridge to Park Careers program graduated on April 18, 2015. 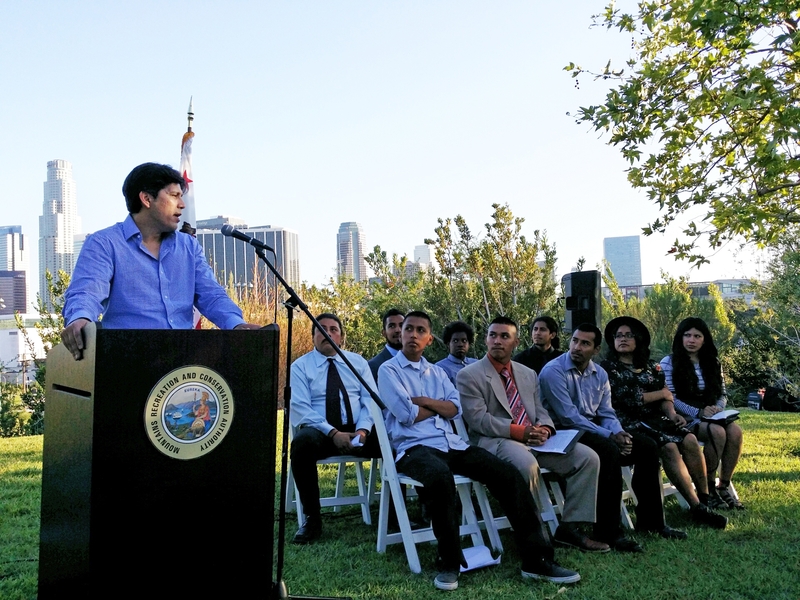 The ceremony was held at the Vista Hermosa Natural Park in downtown Los Angeles. The young adults were recognized by elected officials, such as California Senate President pro Tempore Kevin de Leon, and community leaders before a crowd of park professionals, community partners, family members and friends. Bridge to Park Careers is the Mountains Recreation and Conservation Authority's (MRCA) job training program, which prepares urban youth (18-26 years old) to be competitive applicants for jobs with park agencies. In an effort for parks to better reflect and serve urban communities, the participants were referred by local park agencies and community-based organizations. We are pleased to report that by the end of the training program, all nine of the young graduates were offered employment by the Mountains Recreation and Conservation Authority. 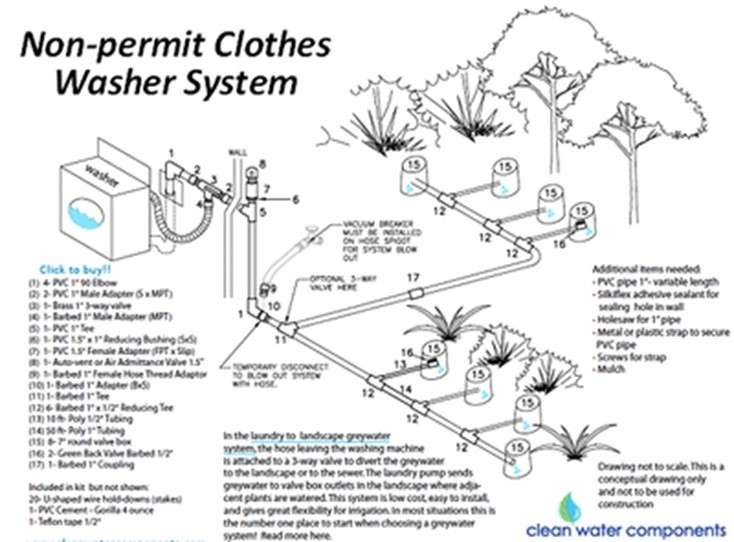 The curriculum used for Bridge to Park Careers merged from multiple separate programs that provided the graduates with certifications (including the UC California Naturalist Certification and the National Association for Interpretation's Interpretive Guide Certification) as well as materials developed just for the program. The curriculum included an overview of the parks movement in Southern California; cultural and natural history of the local mountains; outdoor skills such as orienteering and geography; education and interpretation; customer service and public safety; and leadership development. Sabrina Drill, UC Cooperative Extension's natural resources advisor and associate director of the California Naturalist Program, helped develop this joint training. 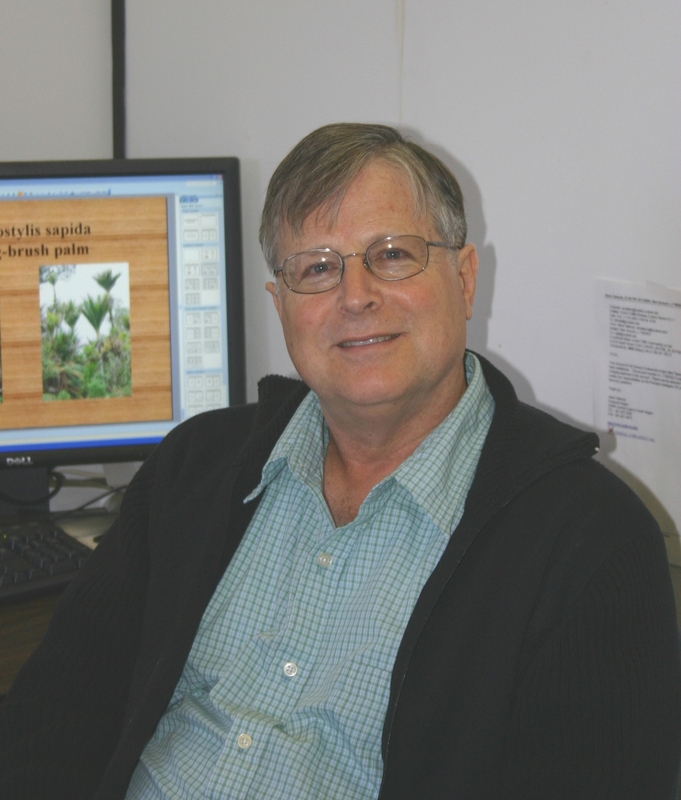 "We at the UC California Naturalist Program, are so proud to have been a part of MRCA's Bridge to Park Careers program. From our initial meetings and in-depth training of MRCA's lead instructor to going out and leading the trainees on a tour of the LA River, we loved being a part of this inaugural class," said Drill. "We look forward to continuing to work with the newly certified rangers as well as the future trainees," she added. 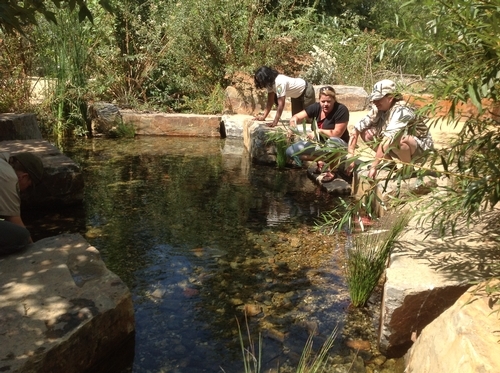 The UC California Naturalist Program is designed to introduce Californians to the wonders of our unique ecology and engage the public in study and stewardship of California's natural communities. The program uses a science curriculum, hands-on learning, problem-solving and community service to instill a deep appreciation for the natural communities of the state and to inspire individuals to become stewards of their local resources. For more information about the UC California Naturalist Program, please click here.